Common sense and yet good to know! - Obey all ushers or monitors and respect safety barriers. - Don’t get close to the actual firing site. - If you find an unexploded firework component, do not touch it – immediately contact the local fire or police department. - Leave your own fireworks at home. - Buy fireworks only from licensed outlets. Follow package directions. Store fireworks in a dry, cool place. - Alcohol and fireworks do not mix. - Never allow young children to play with fireworks, not even sparklers. Supervise older children closely. - Light fireworks outdoors in a clear area away from flammable materials. Keep water nearby. Be sure people are out of range before lighting fireworks. - Light one at a time, then move back quickly. Never stand over fireworks when lighting. Do not try to relight or handle malfunctioning fireworks. Douse and soak them with water and throw them away. - Never ignite fireworks in any kind of container. - Never experiment with homemade or altered fireworks. 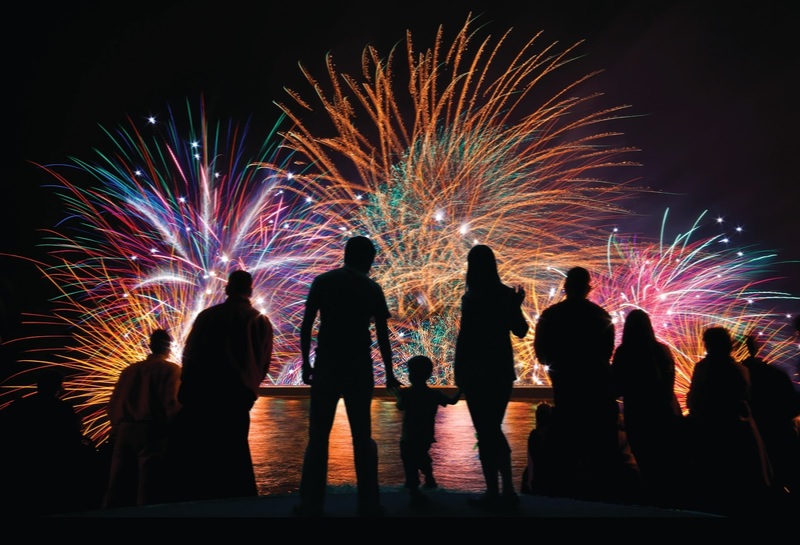 - Dispose of fireworks properly by soaking them in water and then disposing of them.